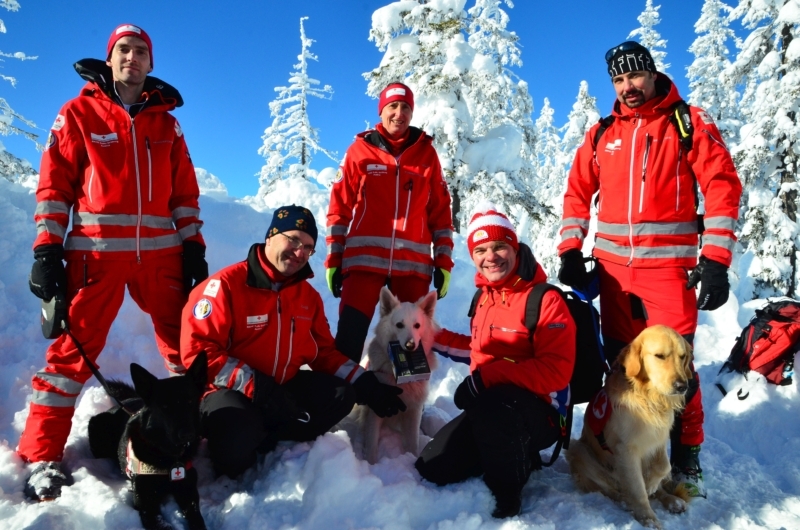 The Red Cross rescue dog squadron is an exceptional special unit of the Red Cross. Their missions are mostly remote far away from sealed roads and villages where navigation plays an essential role. To further improve navigational capabilities JES supported the squadron with 15 brand-new GPS devices with integrated maps. The devices were officially handed over by JES managing director René Jung during an exiting alarm exercise. The new devices not only help the dog handlers fulfilling their task but also persons in distress. 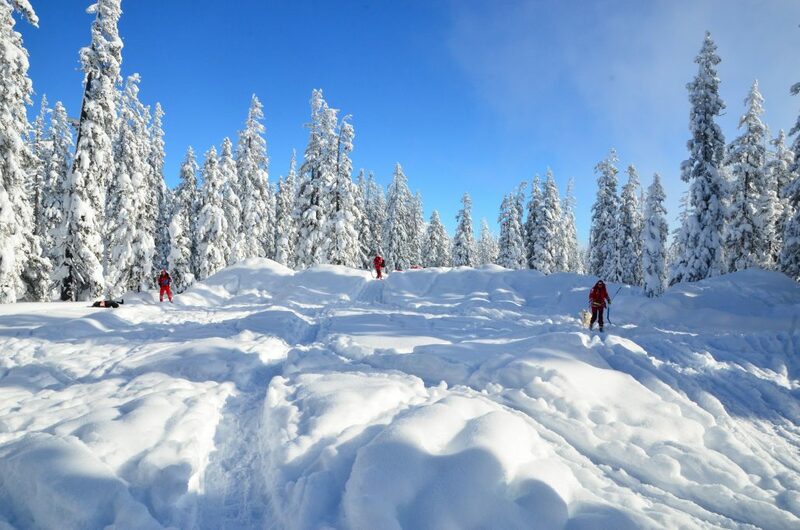 “No matter if persons got lost in summer or are buried by an avalanche in winter, with the GPS devices we can exactly report the location the person has been found. 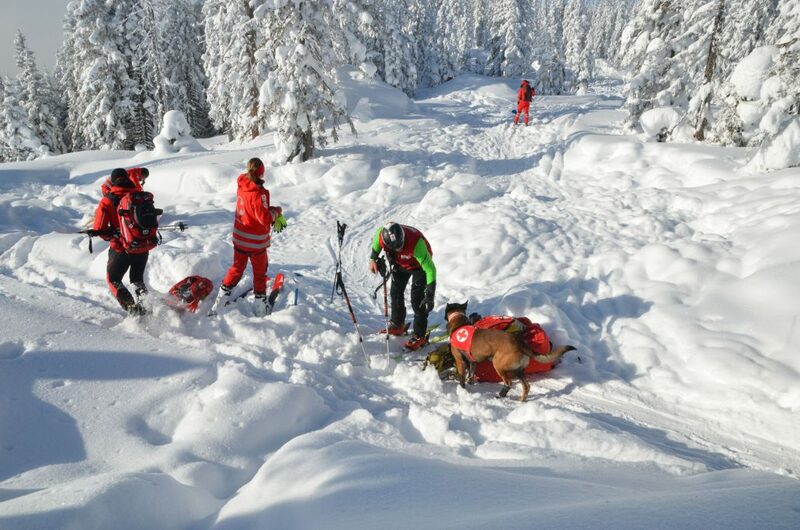 Such the following rescue chain for the injured person is accelerated.”, adds Leopold Slotta-Bachmayr, commander of the Red Cross rescue dog squadron. Traditionally the rescue dogs of the Salzburg Red Cross in January stay a week in Filzmoos. This year in addition to practical and theoretical training a real exercise in the field was planned. “This morning you will have a theoretical first aid training, the afternoon is at your disposal.” said commander Leopold Slotta-Bachmayr to the rescue dog squadron in his morning briefing. His dog handlers did not know their day will be different and a big alarm exercise will be triggered. 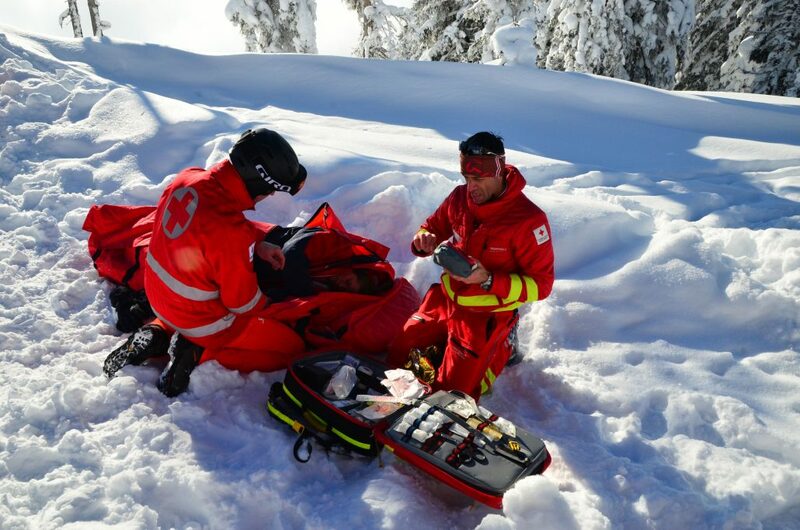 While all dog handlers were in the first aid training they received the alarm: “Avalanche on the Rossbrand in Filzmoos. Situation unclear. 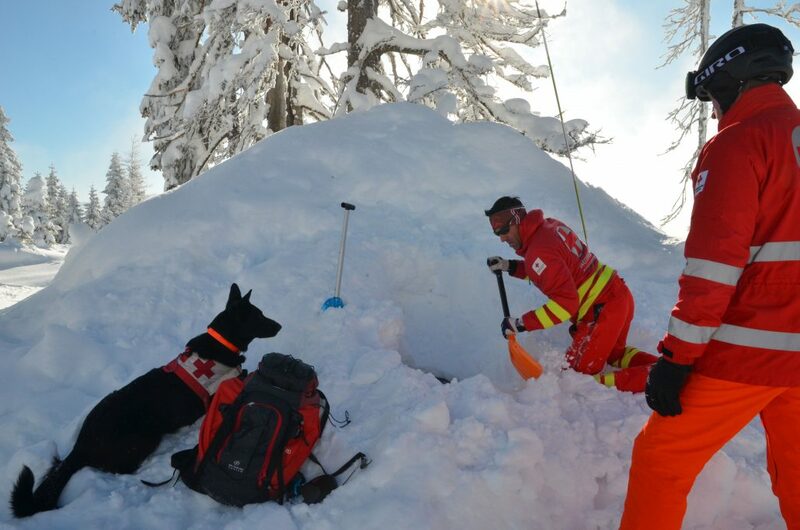 Deployable dog handlers report to the officer-in-charge.” With slight nervosity five dog handlers with their dogs set out for the avalanche site. “We deliberately have sent the younger dog handlers into the field to let them get their baptism of fire. The more experienced teams have organised the mission and played the buried persons.”, explains Slotta-Bachmayr. But not only these five teams were in the field. 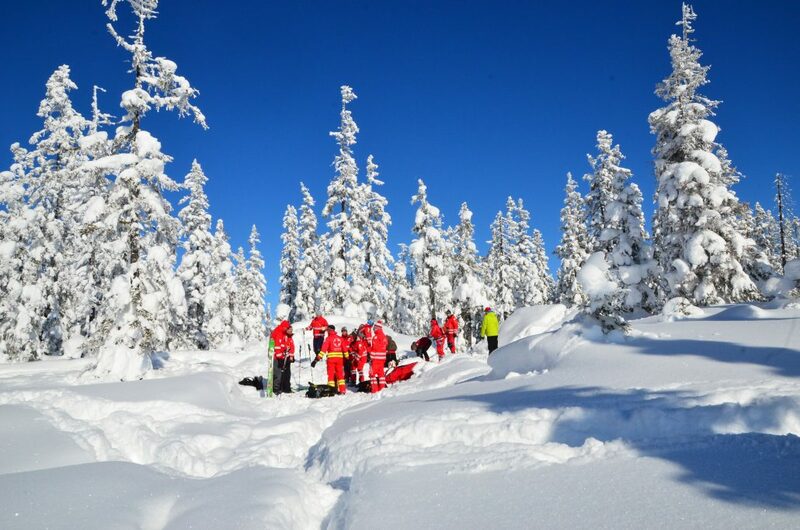 An emergency paramedic, an emergency physician and dedicated shovel squads were involved in the exercise. For the dog – dog handler teams it was more than just searching and finding persons with their dogs. “We tried to simulate difficult conditions. A helicopter was not available for rescue as weren’t teams of other rescue organisations like the mountain rescue service. Our teams had to perform on their own.”, says Slotta-Bachmayr. All in all five persons including an infant – of course not a real one but a doll – needed to be searched, rescued and reanimated. The cooperation between dog handlers, the shovel squads and the emergency physician was flawless. “Of course some details can be improved. To recognise exactly these details it is essential to perform such exercises for the soon-to-be rescue dog handlers.”, says Slotta-Bachmayr in his summary.